Quickspin’s Beowulf slot is based on the epic poem. For the vast majority of people around the world, the 2007 smash-hit film Beowulf, featuring computer animation, was the first time they had ever heard of this epic poem. Global mega-star Angelina Jolie’s portrayal of the monster’s mother was superb, and the integration of live actors with the then ground-breaking animation technique thrilled children and adult audiences alike. The subject matter is hundreds of years old, however, and the story the epic poem tells describes how the hero, Beowulf, travels into the depths of a very inhospitable landscape in order to vanquish Grendel, a monster terrorising a population, along with his mother, whose rage and fury is invoked once her son is vanquished. Beowulf slot is built on this incredible story, and Quickspin has added a number of bonus features to it for players to enjoy at a great many first-rate online casinos. Players will see the hero himself on the left-hand side of the five reels and 20 paylines when the game initially loads, with the snow-covered mountains of Scandinavia stretching behind serving to lay the setting for play. 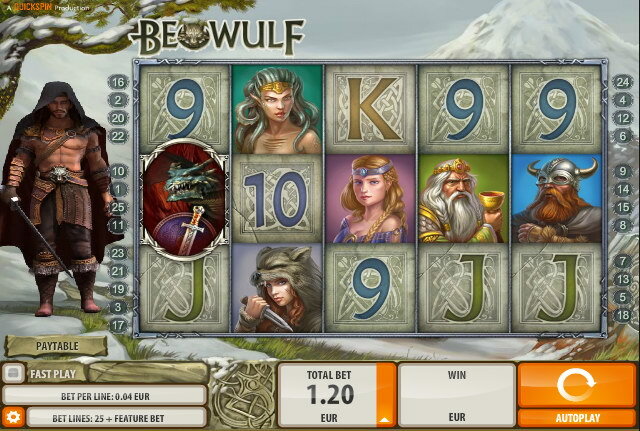 The low value symbols for the Beowulf slot are the nine; ten; jack; queen; king and ace icons, all given a Celtic reinterpretation; and the higher-value icons are all characters from the story itself. Beowulf slot features King Hrodgar, the ruler who initially reaches out to the hero for help defeating the monster; a horn representing the wild appears; and Grendel’s mother, a dragon, is the scatter symbol and key to the bonus portion of the game. An attack by Grendel occurs randomly throughout Beowulf slot, and an indicator that it is on its way is the sky over the reels turning red. Grendel then appears on a variety of places on the fifth reel, which will begin to spin. When the spinning stops Beowulf steps in order to kill the creature, and the number of free spins with which the player has been awarded is revealed. Stacked wilds are also able to appear on the reels during this portion of play, and will remain in place for the duration, allowing players to rack up larger wins than usual. Three of the dragon scatter icons, Grendel’s mother, appearing anywhere on the reels will reward players with a bonus game, wherein a various number of spins are awarded, and a battle between the vengeful creature and the hero takes place when the reels stop spinning. When a sword wild icon lands on the reels it is able to remain in place, and one bar of health is deducted from the dragon icon. When a dragon wild lands the sword symbol is removed from play and Beowulf loses some health. The fight draws to a close when either Beowulf or the dragon’s health is totally depleted, and if the hero has managed to come out on top extra spins will be awarded to the lucky player. The soundtrack for Beowulf slot is in keeping with the dramatic events unfolding on the reels, and the graphics and animations very expertly bring this ancient poem to life, allowing fans of the film to enjoy it in a completely different way.